The movement to democratize Egypt: Except for their religious beliefs, Jews shared lifestyles with those of Muslim background. 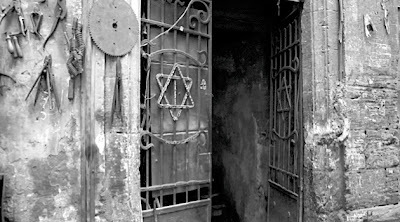 Jewish home in Egypt. Image from BBC Watch. Prior to the Zionist movement’s establishment of the State of Israel on Palestinian land in 1948 and subsequent eviction of hundreds of thousands of Palestinian Arabs from Palestine during the late 1940s, between 65,000 and 80,000 Egyptians of Jewish religious background lived in Egypt. Around 64 percent of Egyptians of Jewish background lived in Cairo and around 32 percent lived in Alexandria, according to the Egyptian census of 1947. In 1947 most Egyptian Jews (59%) were merchants, and the rest were employed in industry (18%), administration, and public services (11%). The economic situation of Egyptian Jewry was relatively good; there were several multi-millionaires, a phenomenon unusual in other Jewish communities of the Middle East…There were no restrictions on accepting Jews in government or foreign schools. And in addition to the relatively prosperous Egyptians of Jewish religious background who lived in Cairo prior to the establishment of the State of Israel in Palestine, there were also “many poor Jews living in the Haret al-Ya Hud section of Cairo who were completely indistinguishable from their Muslim counterparts” in Egypt. And, “with the exception of their adherence to religious belief, they ate, spoke, dressed, and lived in virtually identical ways” as the Egyptians of Islamic religious background, according to The Rise of Egyptian Communism, 1939-1970. Zionism was considered an alien ideology to most Egyptian Jews. So, not surprisingly, although only about 20 percent of the people of Jewish religious background who lived in Egypt were officially considered Egyptian citizens in 1947, “Zionism was generally an alien ideology to most Egyptian Jews,” prior to 1947, according to The Rise of Egyptian Communism, 1939-1970; and the Jewish League to Combat Zionism (al-Rabita al-Tsrailiyya li Muk afahat al-Sahyuniyya), founded in the mid-1940s by an Egyptian named Marcel Israel, included Egyptian “leftists and communists alike,” according to the same book. But since the Egyptian monarchical regime’s prime minister in 1947, al-Nuqrashi, was being backed by some Egyptian Jews who were sympathetic to the Zionist movement (and who also wished to discourage Egyptians of Islamic and Jewish religious backgrounds from uniting in opposition to UK special influence in Egypt), al-Nuqrashi suppressed the Jewish League to Combat Zionism in 1947. Yet when the United Nations voted to partition Palestine -- despite the objections of most people then living in Palestine and other Arab counties and many rank-and-file members of Egypt’s Democratic Movement for National Liberation [DMNL] -- the leftist DMNL group’s leadership -- like the Soviet Union -- endorsed the partition plan.